Enjoy Thanksgiving dinner guilt-free and walk or run the 5K or one mile course along the beautiful Wrightsville Beach Loop! This race is fun for the whole family with a 5K and 1 Mile Fun Run. You can run or walk either race distance. In 2017, more than 2,700 people participated in the Turkey Trot and raised a record amount for Cape Fear Habitat! This success has allowed Habitat to build a Turkey Trot-sponsored home in Wilmington. 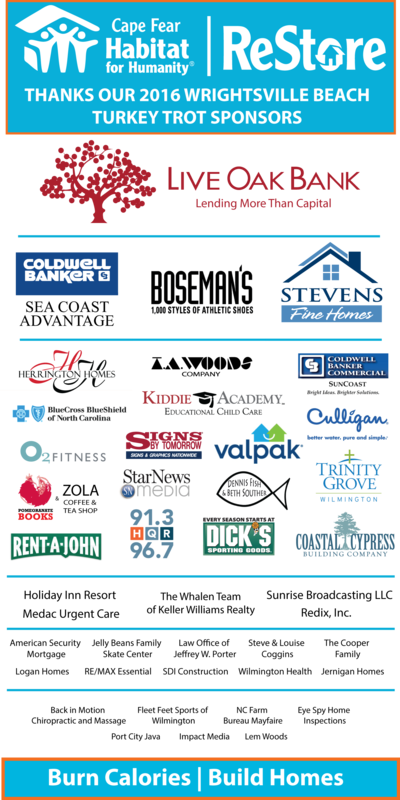 For more information about the Turkey Trot or to become an event sponsor in 2018, contact Lynne at lynne@capefearhabitat.org or 910-762-4744 ext. 102.